here are quite a few photo sharing sites you can use and most of them are free of charge. Photobucket is one of them and the one I use. Photobucket is free to use if you don't mind the advertisements. I pay Photobucket $25/year so I don't have to see the ads plus I get some other perks that the free customers don't get. Go to Image hosting, free photo sharing & video sharing at Photobucket and sign up for an account, free or fee is up to you. Once you're signed up and have your account, you can start uploading pictures into photo albums that you create to separate your pics into relevant groupings. You're given a default photo album to start with which is where I place all my pics that don't seem to go in any particular album. 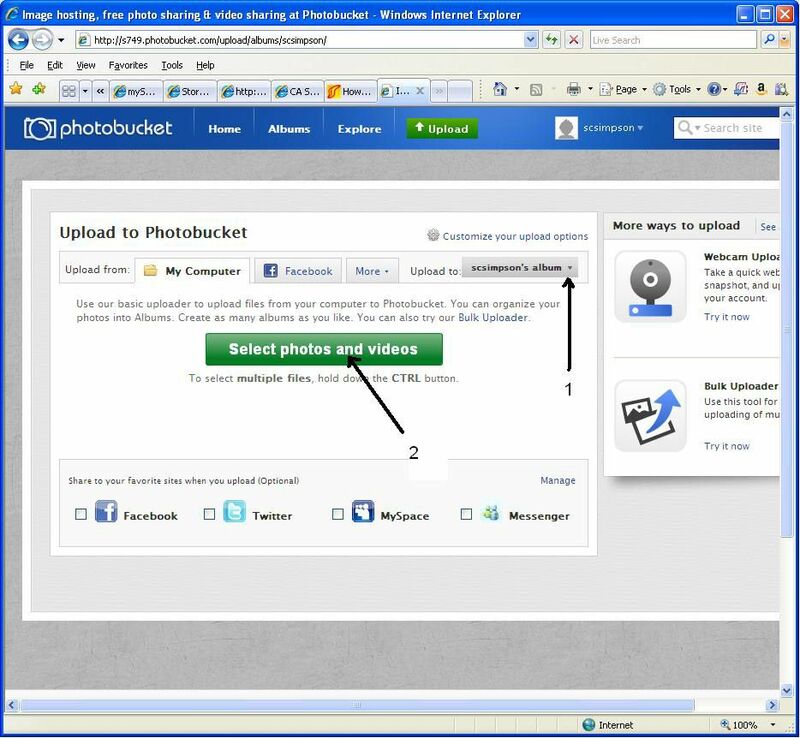 At the top of the Photobucket page is a green "Upload" button. Click it and you will get this page. 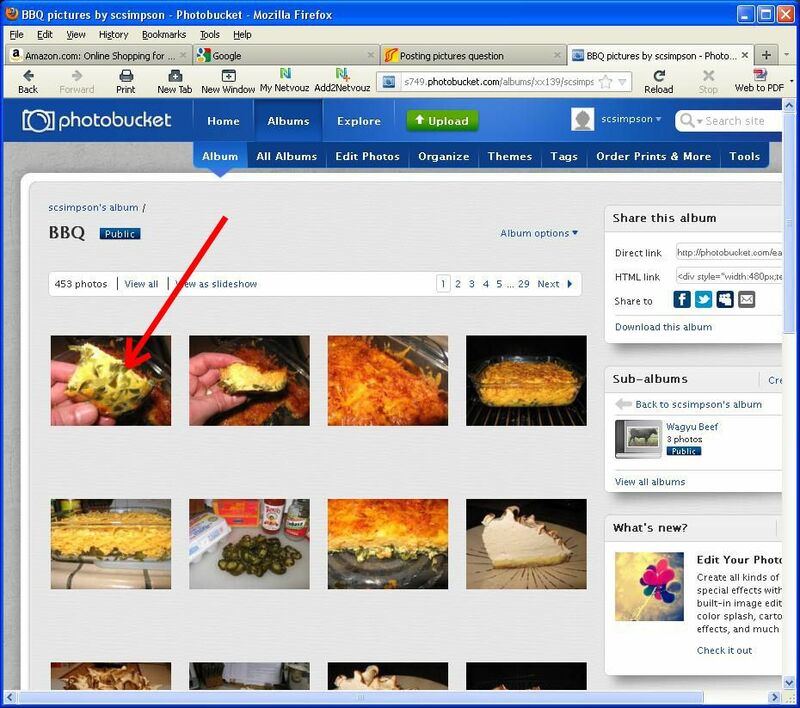 1) Select the album you want to upload your images to. It will have your default album listed but you can change it to any album that you have created. 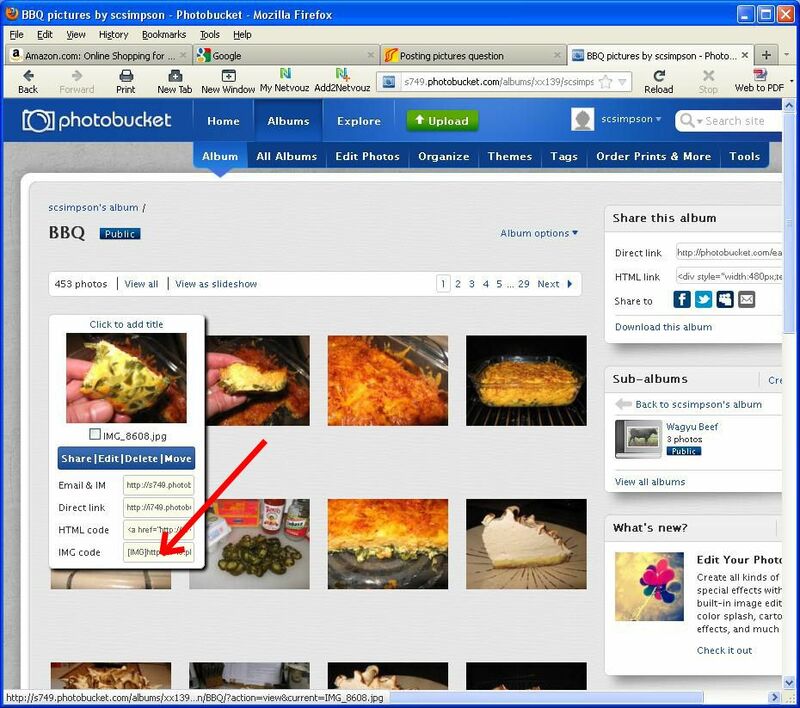 It will also give you the option to create a new album to place the images you're uploading into. 2) Once you've selected the album to place the pics into, you can then click "Select photos and videos" button. 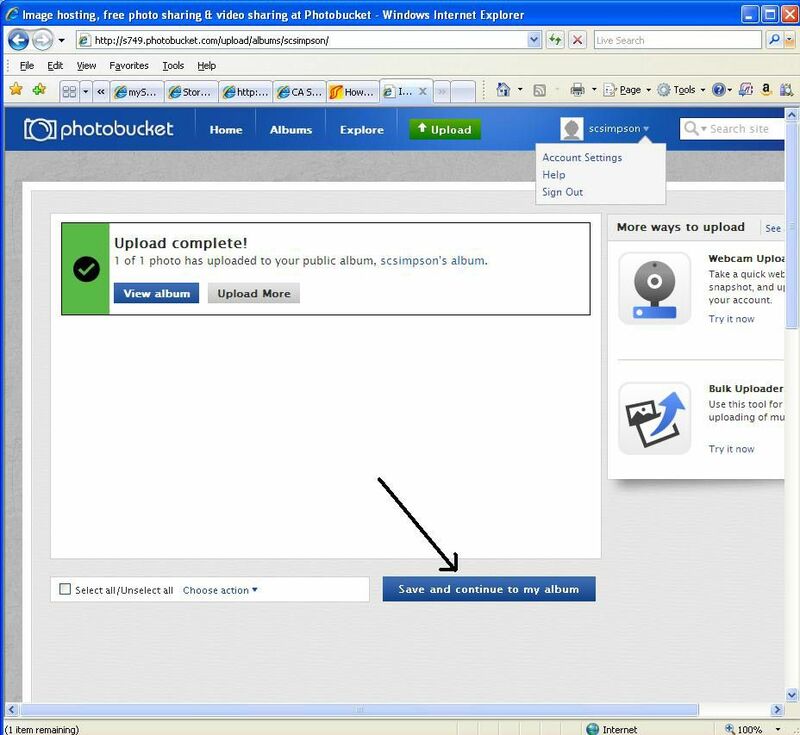 You will be given the opportunity to select all the photos you want to upload and then click the "Open" button and the pics will upload to your selected album on Photobucket. In this example, I'm uploading to my default album. Find the image you want to have displayed in your post and move your mouse pointer over the image. 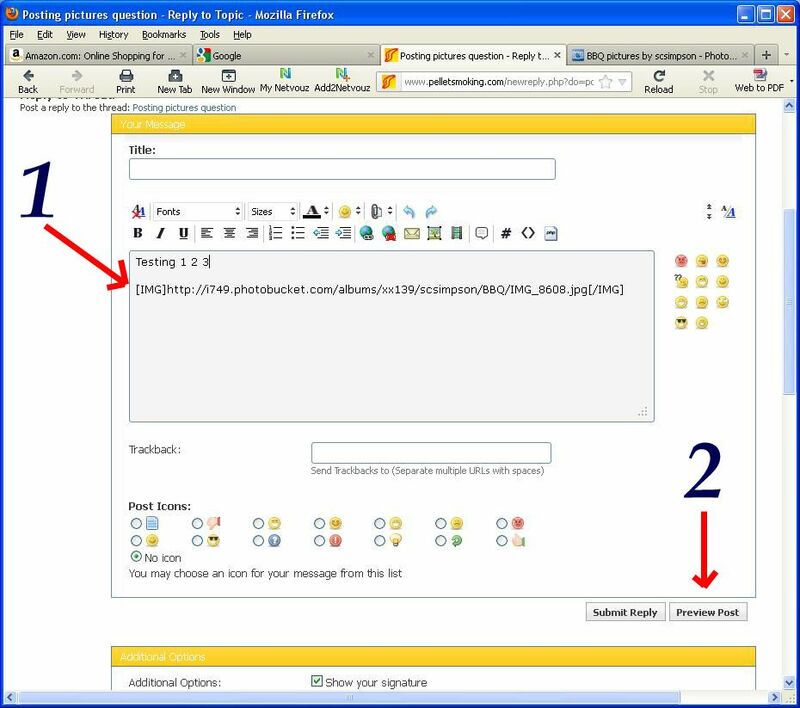 A drop down box will appear with some picture code options for various purposes. For the forum, we want to use "IMG code". Move your mouse pointer right over the actual code (right where the arrow is pointing) and left click. You will see the word "Copied" appear then disappear. You now have the IMG code copied and are ready to place it into your post. 1) Go back to the forum and place your cursor right where you want the pic to appear in your post and either perform a Ctlr+V or right click and "Paste" to put the IMG code in your post. 2) Left click "Preview Post" or "Go Advanced" to see what it looks like. 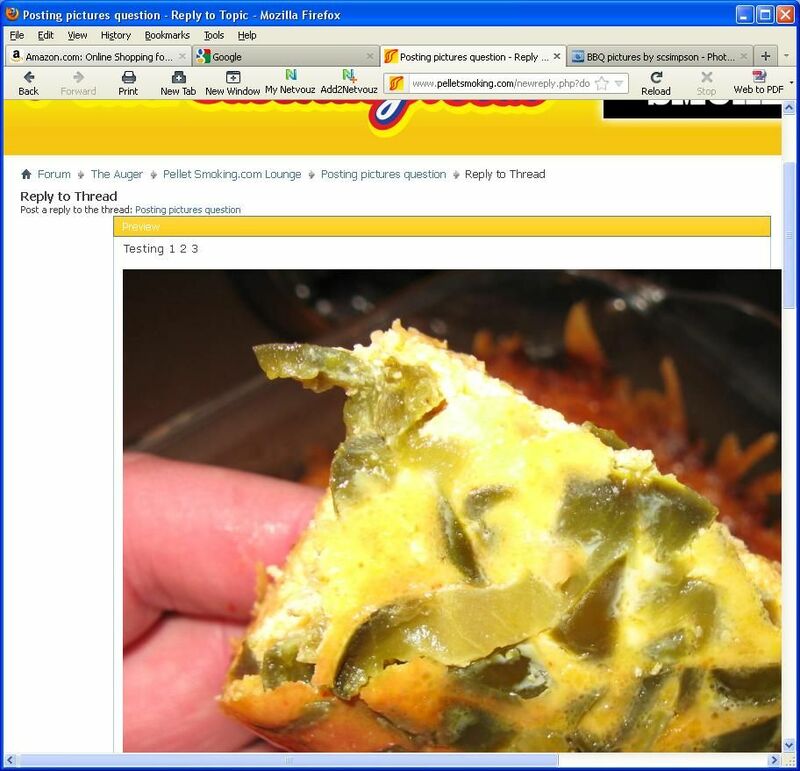 The preview function will show you how your picture will look on the forum. If you like what you see, click the "Submit New Thread", "Post Quick Reply", or "Submit Reply" button depending on whether your submitting a new thread or replying to someone elses thread. Some things to be aware of, the forum limits you to 10 images per post. If you have 11 images you need to display, you'll need to break them up into two posts or replies. Also consider this, posting 10 images per post will take up a lot of bandwidth loading and those with slower broadband connections will experience delays while their browser loads all the images. Thanks a TON for posting this. I've not been able to post any pics yet, and as someone said a few weeks ago, "no pics equals no proof of smoking!" I'll get right on this so I can start posting everything I've done so far!!! !